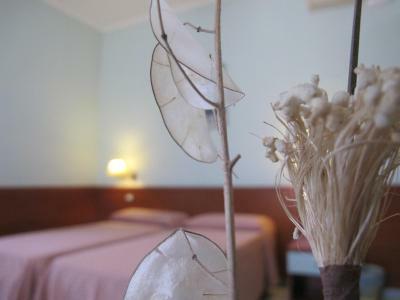 Lock in a great price for Hotel Katty – rated 8.2 by recent guests! The staff was nice and helpful. They let me check in late because my train came in very late and had an electrical outlet adapter that they let me use. Clean bathrooms and clean rooms. Location is convenient to the central station. Close to the train station and bus line going to the airport. Clean, friendly staff, lots of restaurants nearby and cozy. The Staff at the Reception was nice. The location is great, since it's really close to the Train Station. Clean place. Air and wifi are included and worth it when working properly. Nothing fancy but worth the money if you are looking to save some money. Great location and helpful management. We really only needed a good place to sleep as we were busy with tours and exploring the city. 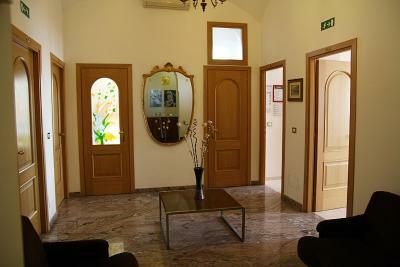 The staff were most accommodating helpful and friendly. the room was simple but very clean. the hotel is quite close to public transportation we had very good time and we'll be happy to come back to stay. Hotel Katty This rating is a reflection of how the property compares to the industry standard when it comes to price, facilities and services available. It's based on a self-evaluation by the property. Use this rating to help choose your stay! 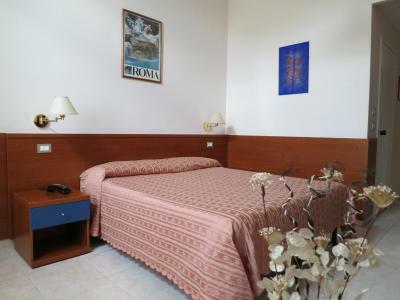 One of our top picks in Rome.Only 1,150 feet from Castro Pretorio Metro Station, Hotel Katty offers central, en-suite accommodations. A shuttle service to Ciampino and Fiumicino Airport is available, and Wi-Fi is free. 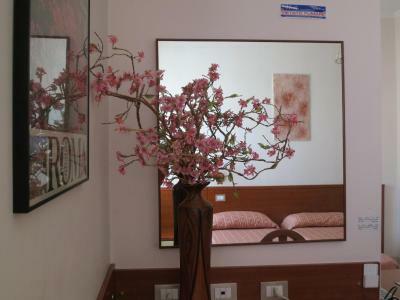 All air-conditioned, rooms at the Katty Hotel have a simple décor and tiled floors. 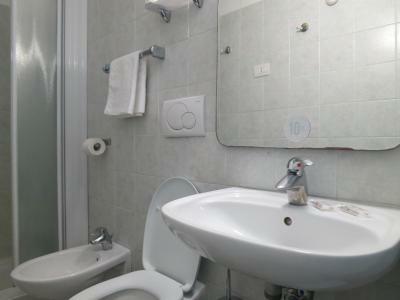 Each features an LCD TV and a fridge, and the bathroom has a shower and a bidet. 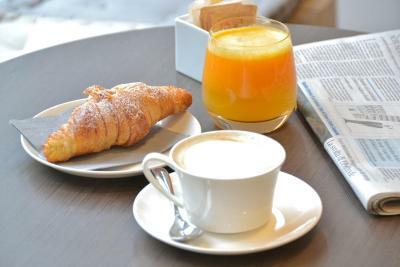 When included, an Italian breakfast of croissants and cappuccino is provided daily at a nearby café. The surrounding area offers several restaurants and pizzerias. 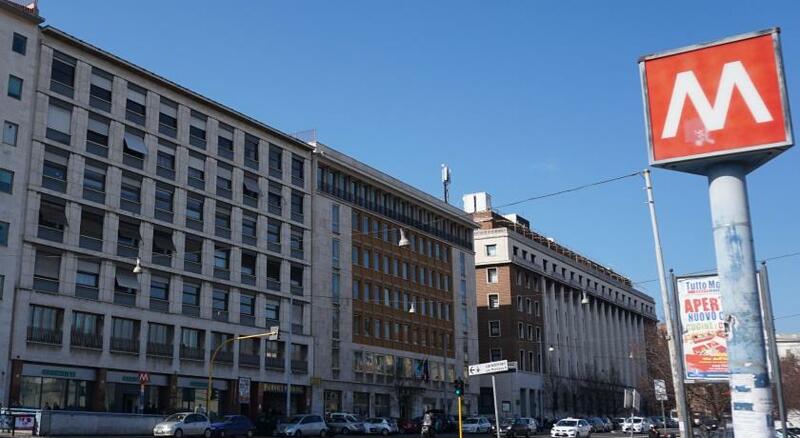 Termini Station is an 8-minute walk or 2 metro stops away, while Villa Borghese is 1.2 mi from the property. The lively area of San Lorenzo is a 10-minute walk away. When would you like to stay at Hotel Katty? 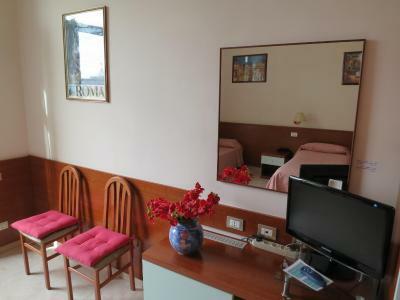 Air-conditioned room with an LCD TV and refrigerator. The private bathroom has a shower and a bidet. 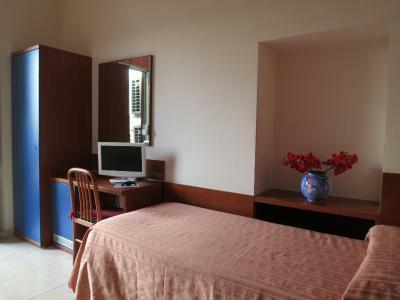 Spacious air-conditioned room with an LCD TV and refrigerator. The private bathroom has a shower and a bidet. House Rules Hotel Katty takes special requests – add in the next step! Hotel Katty accepts these cards and reserves the right to temporarily hold an amount prior to arrival. Please inform Hotel Katty of your expected arrival time in advance. You can use the Special Requests box when booking, or contact the property directly using the contact details in your confirmation. There wasn't much space for a family of 5. Just enough for beds, bags. We were out all day so this wasn't much of an issue. But as we chose budget accomodation the room was as expected. Price, location and the staff were always helpful. Just 7-8 minutes to Termini. Wi-Fi was sometimes not stable. Very nice location! Absolutely charming personnel. Very quiet. Single bed just a little bit on the narrow side, but that's all I can think of to put in this box. 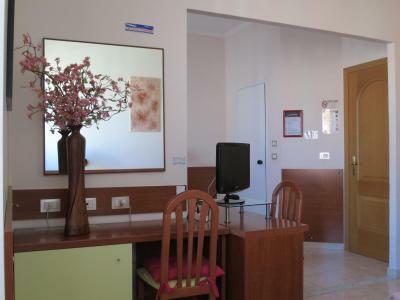 Clean, friendly, good shower and a great location: as a budget option in Rome it's the best I've stayed in, and exceeded my expectations for the price. It's easy to find and walk to from Termini down well lit streets, and as a lone traveler I felt safe and cared for as a guest. 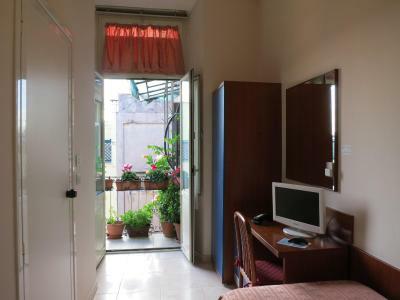 I've had some bad experiences in budget options near Termini in the past, so I was relieved to find a place which doesn't exploit the high demand for accommodation in that area. In the end, it's people who make the difference between a good stay and a bad stay, and I'd definitely recommend Hotel Katty for the excellent staff and their commitment to guests. I can mention only small things, like shutters on the window, which were old and difficult to handle and not very convenient shower-cabin, but it didn't cause me any trouble. I'd also like to have an electric kettle and a cup in the room to make tea, but it's very seldom in Italian hotels so I didn't expect to have it. I've already stayed at this hotel several years ago, when I visited Rome for the first time. I liked it then and was very glad to stay there again. Everything was fine, I've got what I expected: a clean and warm room with a bathroom, there was a wardrobe, a small fridge and a hair dryer. Wi-fi worked well. 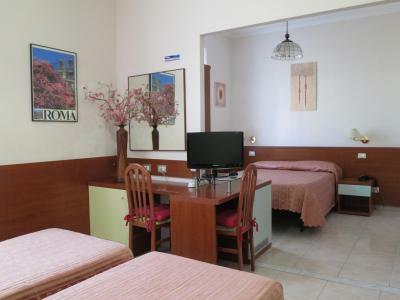 It's about 10 min to walk from/to Termini station and 3 min to Castro Pretorio underground station, there's also several bus stops around the hotel, so it's quite easy to get to any place in Rome by public traffic. One can also walk to the very center of the city and it's main historic and cultural objects. We were charged 120euro for a return shuttle when they originally told us it would be 100euro, then claimed it was a mistake in their email. They charged us for the city tax which Booking.com says is included but gave us a discount for paying cash so ended up more or less the same price. We were able to get a kettle from reception on request - but no cups! Was not impressed to be woken up just after 10am on the Sunday morning following a hard day's drinking and late night at the Rugby on the Saturday to be ordered to vacate the room so that they could change the bed linen! Shuttle bus service very handy, picked us up at the airport and then took us straight to the hotel. Rooms were large and comfortable. Maximum heat temperature in the room too cold for winter. Quite far from city's tourist spots. We arrived at the hotel 10 mins before the reception will close. The owner or receptionist still allowed us to check-in despite her going to bed already. Plus no additional charges were made just because of nearly late check-in. It was a little noisy - people talking loudly and some sounds. Everything was nice, clean and comfortable. The staff was friendly and helpful. 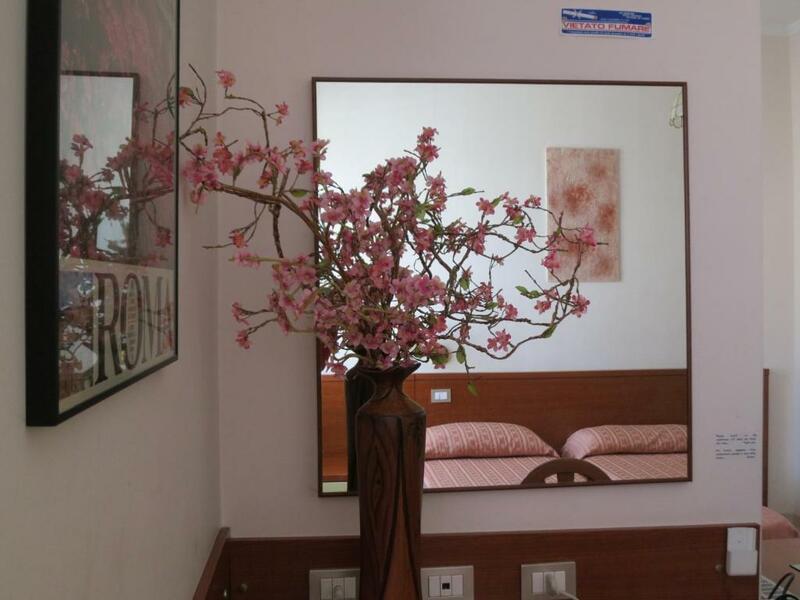 The location is convenient - not far from the main railway terminal and metro. The room was a bit on the colder side as there seemed to be an issue with the heating but it was fixed, so no problem actually. The elevator is weird, but once you figure out how to close the door, it's all well. 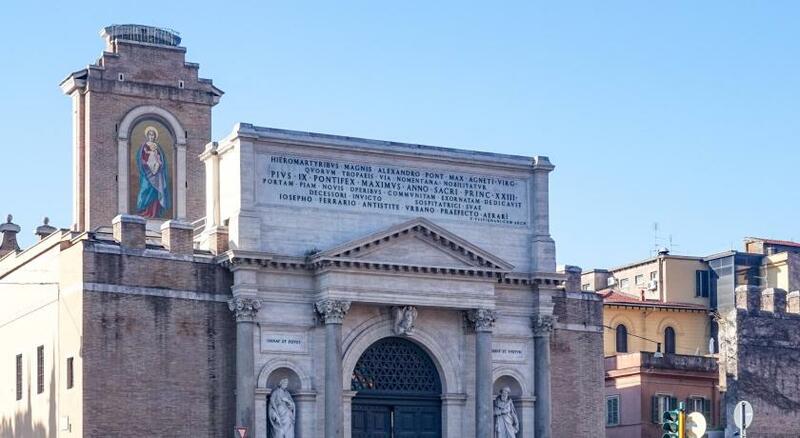 It was very easy to find, close to Termini station and about 5-6 minutes walk to the metro station there that connects all the major sights in Rome (more or less). 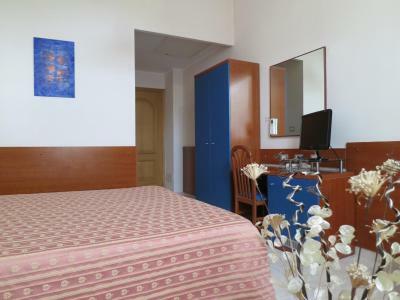 The room was clean and it was on the cheap side, so excellent value for the money. I met 3 of the staff members during my short stay there, and they all seemed nice. 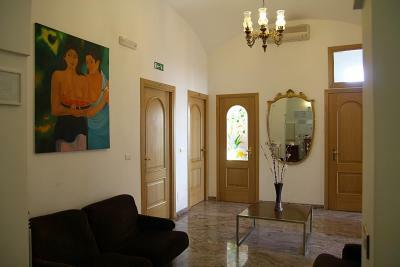 Nice location,3 minutes to metro staion Castro Pretorio, and 7 minutes to Termini. For that price it is hard to wish more. We liked our room and how clean it was. The bed was comfortable, there was a TV and a fridge. Also fresh towels every day. The staff was very friendly. 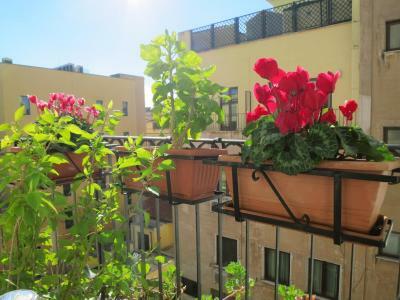 The location was perfect, because it's not too far from Termini station and the city center is also walking distance from the hotel.